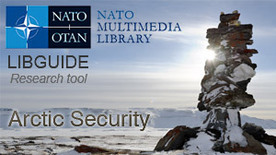 This LibGuide is intended to provide a few starting points to assist you with your research on issues related to Arctic security, in particular within the NATO context. In an article published in the Harvard International Review (Spring 2015): "A Place Apart", A. Fogh Rasmussen, former NATO Secretary General, "offers suggestions on how the West, the North Atlantic Treaty Organization in particular, can respond through the development of an Arctic strategy to deter military threats." In October 2016, the Stockholm International Peace Research Institute publishes "Military capabilities in the Arctic: A new cold war in the High North?" by Siemon T. Wezeman. For an overview of Russian capabilities in Arctic: "Russia’s Evolving Arctic Capabilities" by Steve Micallef, Center for International Maritime Security (7 February 2017).